A Muslim is a believer in or follower of Islam. The word Muslim means one who submits and implies complete submission to the will of God(ALLAH). Muslims believe that nature is itself Islamic, since it follows natural laws placed by God. Thus, a Muslim strives to surrender to God's commands every step of the way. Until recently the word was also spelled Moslem. Muslims do not recommend this spelling because it is often pronounced "mawzlem," which sounds somewhat similar to an Arabic word for "oppressor." 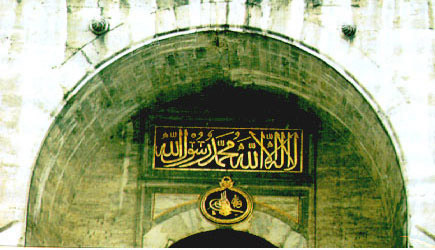 Many English-language writers used to call Muslims "Mohammedans" or "Mahometans", meaning "followers of Muhammad", but this terminology is considered incorrect and insulting, because Muslims believe it implies that they worship the prophet Muhammad, contrary to the fundamental principles of Islam itself. The holiest book for Muslims is the Qu'ran or the 'Koran' in English. Muslims consider the Arabic Qur'an as the direct revelation of God; translations do exist to other languages but are not regarded as the literal words of god. Muslims believe that God has revealed one religion to Mankind, namely Islam, in different stages via Messengers. Muslims believe that God's final Messenger, Muhammad, completed the religion according to God's command. Muslims believe that previously revealed scriptures, such as the Injil (Christian Gospels), the Torah and the Psalms, have been changed by Mankind, whereas God promises that the Qur'an cannot be changed and will not be changed. One and a half billion people (more than one fifth of the world's population) from a vast range of races, nationalities and cultures across the globe - from the southern Philippines to the western coast of Africa - are united by the common Islamic faith. Of these, about eighteen percent live in the Arab world. The world's largest Muslim community is in Indonesia, and substantial parts of Asia and much of Africa are Muslim, while significant minorities are to be found in what used to be called the Soviet Union, as well as China, North and South America, Europe and Oceania. For Muslims, Islam is both a religion and a complete way of life.